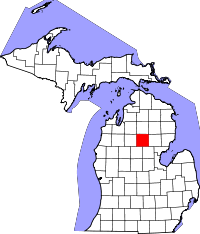 Roscommon County, founded in 1840 and renamed Roscommon after County Roscommon in Ireland in 1843, was one of several counties renamed after locations in Ireland as a tribute to the greatly expanding Irish and Scottish populations in Michigan at the time. The County Clerk is located in the town of Roscommon, which locals refer to as simply, "Rosco", and researchers are allowed access to vital records in that office. Both birth and death records begin in 1874 and continue to the present, and marriage and divorce records begin in 1887 to the present. To view or obtain birth records dated more recently than 100 years ago, individuals must be able to prove legal relation to the original certificate recipient, as well as supply the place and date of the original recipient's death. All other record types are open to the public and require only a picture ID to access. Search Fee: $6.00, $12.00 without.